Update: the Court Jester has now closed. A few weeks ago I had walked down to the Court Jester Cafe with Sylvia one quiet afternoon and we were the only people in the cafe. I loved the cake, the quirky decor, the light-filled space and there were pierogi on the menu. 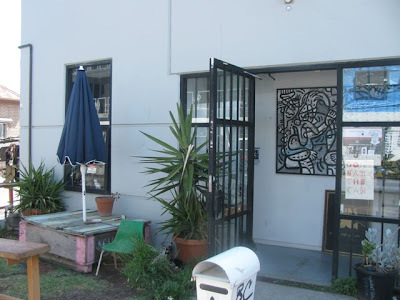 So I returned on the weekend with a few friends only to find that following a review in the Age newspaper, the place was absolutely abuzz with customers. However amid the chaos and crowds it retained the bohemian charm that I had loved on my first visit. As soon as I saw Cindy and Michael write up their visit to the Court Jester, I wanted to go there. Not only did it look like an interesting place in the photos but its name is the same as that of one of my favourite films. At regular intervals during my childhood, rainy weekend daytime was cheered up by the Danny Kaye movie with the classic scene with the flagon with the dragon, the vessel with the pestle, the chalice from the palace and the brew the is true! On my first visit I asked if the name had anything to do with the movie and was told it came from a childhood nickname. 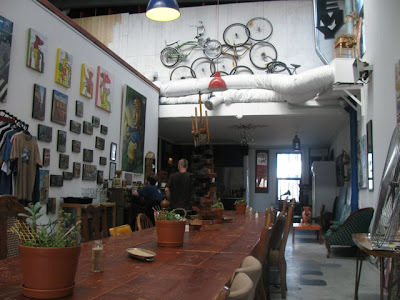 Nevertheless I loved the decor with bicycle wheels, quirky artwork, an odd assortment of chairs around a large wooden communal table carved with student graffit. 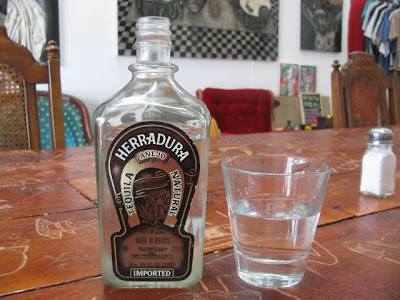 The water was served in chunky old liquor bottles with interesting labels. And what's not to love about a place with a green chaise lounge. I chose the Sour Cherry and Chocolate Torte. 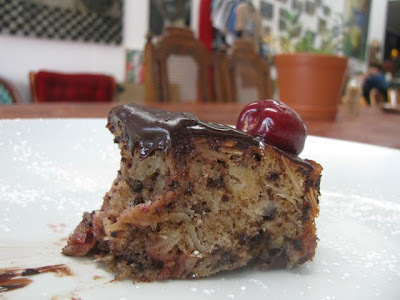 It was a dense moist cake with slivered almonds, flecks of chocolate and fresh cherries through it and melting chocolate and more fresh cherries on top. It was the best cake I have eaten out for ages. One of the benefits of being the only customer is that it is easy to chat to the guys who run the place. They told me that the recipe came from an old lady at a nursing home who had won a magazine competition with it. I would have given her the prize too. Sylvia sat beside me in her stroller and ate the cherries from the top. While looking at the menu I was interested to see the owners, being of Polish and Ukranian backgrounds, served pierogi. 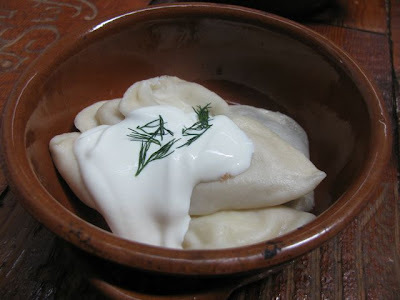 One of my former housemates used to sing the praises of pierogi and even made a wonderful baked yeasted pierogi. So I immediately thought that I would love to go back and sample the pierogi with Will. I also invited another former housemate Nicki who came along with her partner Stuart and 7 month old baby Poppy. With E and Sylvia as well, we would be quite a crowd. So I got nervous when I saw how much busier the Court Jester was on Cindy and Michael's ssecond visit. Then the review appeared in the Age. So I rang and booked a table. It was no problem and they said they had high chairs for the babies but without trays. It should have all gone smoothly but the day started with many bad omens. It was too hot to walk so we took the train and then I took a wrong turn so we were late. Then Nicki and Stuart drove up beside up and said they had not been able to find the place. It is a little off the beaten track behind Sydney Road. We finally arrived to find the place busy, the owners frantic and no empty seats in view. It didn't take long for a group to leave so we could have a seat but we were warned that there was about a half hour wait for food. That didn't bother us as we had plenty of catching up to do but the high chairs were literally that. Not baby chairs but chairs that were higher off the ground than most. So we had to hold Sylvia and Poppy. Wriggly babies don't make for relaxing conversation but we managed. It was too busy to put Sylvia on the floor to play, despite some kiddie toys in a box, but it was a great place to take the babies sightseeing and show them odd decorations. 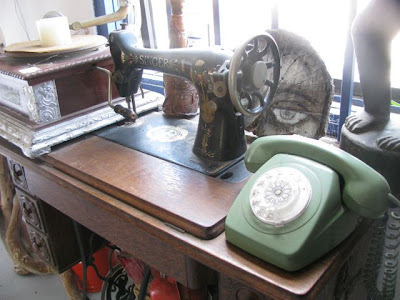 It made me laugh when Sylvia didn't recognise the old rotary dial phone because these were the phones I grew up with. She loves an electronic phone with buttons and beeps and lights. Meanwhile conversation veered from Nicki's writing projects to prog rock to Will's gay cat. Will, Nicki, Stuart and I ordered pierogi and salad. It came in tantalising dribs and drabs. We asked for a selection of pierogi but the (boiled not baked) dumplings seemed to be mostly potato and cheese with only one mushroom and cabbage filling spotted. Those Eastern Europeans love their carbs and a generous dollop of sour cream. Unfortunately the salads came separately. 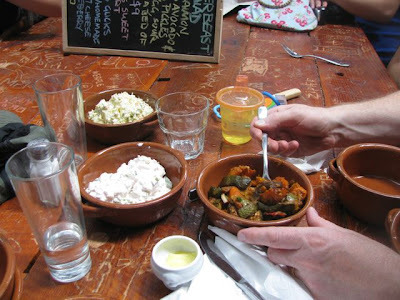 They were a combination of potato salad, roasted vegetable salad and a smetana (sour cream and cottage cheese) salad. We all agreed they were very tasty. The rate at which they disappeared was testimony to that. On the plus side, the staggered serving of dishes meant less dishes to move out of reach of the babies. E had poliski toast (with bacon) and said it was very good. Sylvia also enjoyed some of the Dench sourdough toast. By the time Will and I were eyeing off the desserts, Nicki and Stuart decided they had had enough of Poppy bouncing up and down on the table and that it was time they left. Unfortunately the place was so busy that there were a few breakages while we were there. One was the plate with the wonderful cherry and chocolate torte. How disappointing! But it did force me to try something else. I would have liked to try the cherry pierogi but didn't want to wait for ages. 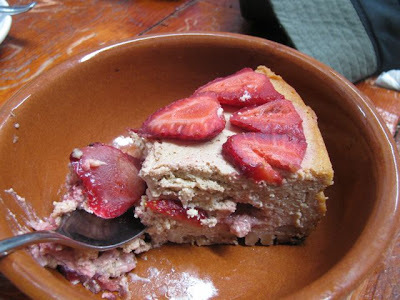 The rhubarb honey drink was finished so I ordered a piece of Baba Gwen's plum cake and Will ordered a slice of Baba Gwen's coffee and strawberry cheesecake. Unfortunately they did not ask us if we wanted cream. My cake came out covered in cream and Will's came with no cream at all. If only they had given Will the cream and left mine off we would have been much happier. As it was, I had to ask for a piece without cream because it was just too much for me and for Sylvia. Once we had a piece of cake that was denuded of cream Sylvia and I enjoyed the cake. Will enjoyed his cheesecake but neither of our cakes had the wow factor of the chocolate and cherry one. But overall it was a great way to spend the afternoon. 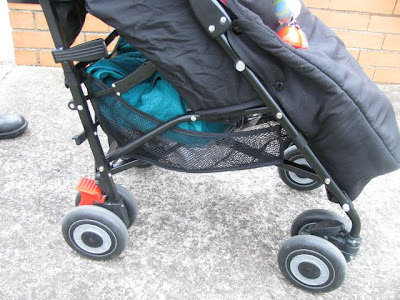 After lunch, Will and I meandered along the back streets back to our place where he had parked and Sylvia had a lovely sleep in the pram. E took the quick option of the train because he had a haircut to go to. When discussing it later, E and I agreed that some of the service was chaotic because the crowds seemed to have descended upon the place but that it was friendly and the place had charm. I was coveting much of the food that wafted past us and would love to go back and try the vegie burgers and/or the platters. (There is more to try in the cafe than on the web menu which doesn't look so veg friendly.) The Court Jester is only open for breakfast and lunch but if you have a group of 10 people or more they will open for dinner. I quite fancy the idea! Yet again time is short but I have an abundance of good food to share. I have been baking a lot lately because I need it on for so many reasons - to feed Sylvia healthy baked goods, to use up fruit that is on the edge, to comfort myself when work is stressful, and because I love it. So today I will give you two healthy baby muffin recipes full of fruit and an indulgent chocolate cake because we can't always be as healthy as we would like. I shall start with the gluten free vegan apricot muffins that I made last week. When Sylvia started on solids, my sister in law Erica lent me a baby food cookbook that my sister Susie had lent her. 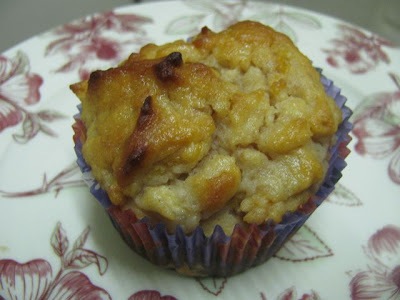 One of the first recipes that caught my eye was a simple recipe for Gluten Free Apricot Muffins. It had a cup of rice flour and a cup of soy flour. These are flours that I can easily rustle up in my pantry. Plus, I had a tin of stewed apricots in juice that had been in my cupboard for quite some time. I decided that I would substitute bananas for eggs so they would be vegan as well as gluten free. When I tasted the batter before cooking them I was a bit concerned that it tasted rubbish. However when they came out of the oven I was pleased with the results. Not very sweet but soft and full of flavour. They tasted particularly good with cream cheese and plum jam. 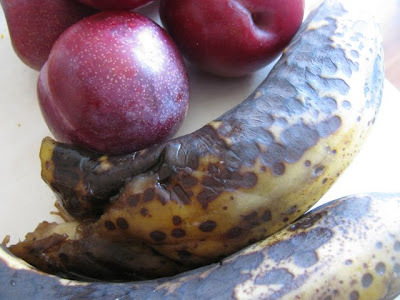 On a roll with vegan muffins, I found some very manky bananas and irresistable blood plums at CERES market. Blood plums have a special place in my heart. They are the only plums I remember eating in my childhood but they never taste as good now and they did then. On the same day I bought them, I decided to bake them in muffins in the short period of spare time while waiting to catch up with a friend. I don't think the bananas would have lasted much longer. They were even going to mush in my bag. I adjusted a recipe from Tofu for Two and found the hard way that my muffins were taking a lot longer than Anni's to bake. I had a quick look at the muffins when I was ready to leave. Close enough for jazz, I thought, but when I tipped them out onto a wire rack to cool they collapsed. I put them back in the muffin tins, turned off the oven and ran out the door. When I returned they still looked sunked. E said they looked like they had been punched. But they tasted good, if not very sweet. However, I thought the recipe needed some tweaking because it was so moist. After all my virtuous cooking, I needed to indulge in some sugar, eggs and butter. Oh yes, and some chocolate would be very nice! I blame returning to work in an organisation that is in refunding chaos. I had made Nigella's Store Cupboard Chocolate Orange Cake from How to be a Domestic Goddess some year's back for the ex of one of my sisters. It lingered in my memory as a pleasant cake. So when my mum gave me some of her runny marmalade months ago I planned to make the cake. As often happens, it took me a long time till I finally made it. Rather than making it for a social gathering as I planned, I made it because I needed chocolate and we were out of any dairy. Every recipe needed milk or buttermilk or yogurt. This was dairy-free. Unfortunately I didn't have quite enough marmalade. But in the spirit of emptying my store cupboard I topped it up with a little honey. My chocolate was also not the finest quality. So when the cake came out of the oven and tasted merely ordinary, I blamed my ingredients. The next day, I found that it was my impatience that had been the culprit. After resting, the cake was as lovely as I remembered it. Dense and moist with a slight citrussy bitterness and the odd chewy piece of rind from the marmalade. 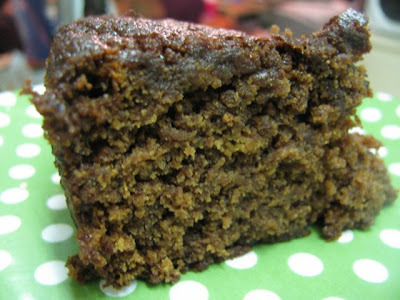 It wasn't the prettiest of cakes when sliced but kept very well in my lunchbox and was a happy spot in my day when everything else was seeming a bit hopeless. Sated with my chocolate cake, I decided to return to some healthier baking for Sylvia this week. 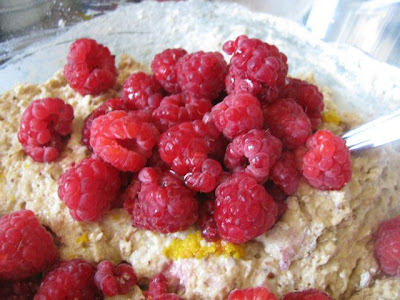 I had bought raspberries on special and decided to try them in the plum muffin recipe. I added more flour and reduced the Sylvia on floor with muffin papers, rice crackers. They were fantastic. The chocolate cake was not really baby food but I made the muffins specially for Sylvia. My mum says she shouldn't have too much sweet food, which is why I have really reduced the sugar in these recipes. However I quite enjoy having my muffins fruit sweetened rather than by refined sugar. Sylvia has loved these muffins. She stuffs them into her mouth with delight. So you would think she would make it easy for me to bake for her. Oh no! I have her clinging to my legs so it is hard to get to the pantry and when I do open the pantry she is straight into it and pulling out anything she can. 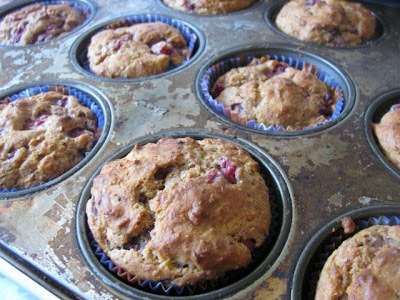 When making the plum muffins, I had to hold her while I spooned the batter into the muffins papers. 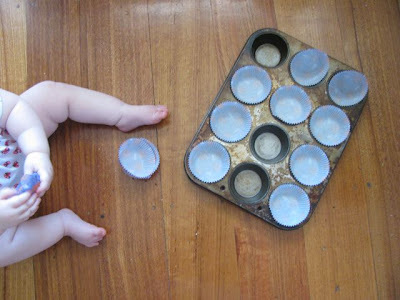 She was even more grizzly when I made the raspberry muffins and the only way I could get her out of my hair to bake was to put her on the floor with the muffin tray, papers and some of her rice cakes. Fortunately they don't take long to whip up a batch. Finally I noticed that Srivalli is holding an event called Kid's Delight and the theme this month is Wholesome Snacks. I really like the banana and raspberry muffin combination so I am sending this to Srivalli as I am sure she will enjoy it too. But I am going to be trying other fruits with banana in this recipe and I would be interested to hear from anyone else who does. Preheat oven to 180 C. Grease and line a 20cm round cake tin. Melt butter in large saucepan. When butter is just about melted add choc chips and stir over low heat until just melted. Add marmalade, honey, sugar, salt and eggs. Stir until amalgamated. Then gradually stir in flour until mixed in. 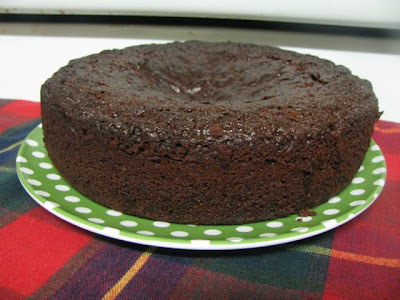 Pour into prepared cake tin. Bake for about 50 minutes or until a skewer inserted in the middle comes out cleanly. Preheat oven to 160 C and grease or place paper liners in muffins tin. Drain apricots, reserving 1 cup of juice. Roughly chop apricots (I used kitchen scissors) and gently mix with flours, baking powder, and cinnamon. In a small bowl use a fork to lightly whisk together apricot juice, oil, buttermilk and egg. 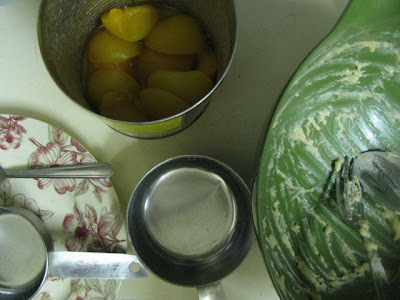 Pour into the apricot and flour mixture and gently mix until just combined. Spoon into muffins cups and bake for 30 minutes or until golden brown and a skewer inserted into the middle comes out cleanly. Cool on a wire rack. Preheat oven to 180 C and line muffin tins with paper muffin cups. Mix margarine, banana and flax seeds together in a large mixing bowl, then mix in milk, vinegar, and apple concentrate (and orange zest if using). Leave to stand about 5 minutes for flax seeds to absorb moisture. Add dry ingredients and stir til just mixed. Gently fold in cubed plums or raspberries. 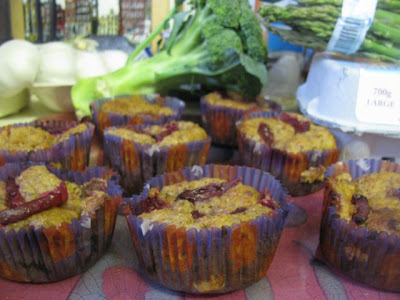 Spoon into prepared muffin cups and smooth a little with the back of a spoon. 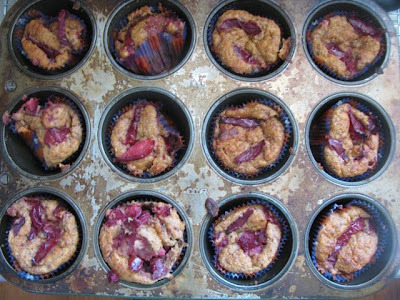 If making plum muffins decorate with plum slices. Bake for about 30 minutes or until golden brown and a skewer inserted in the middle comes out cleanly. Keeps about 3 days. Serendipity and blogging is a wonderful thing. 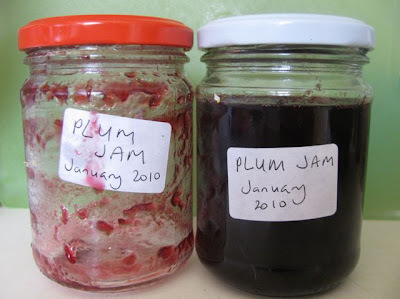 A chance comment can lead to a superb plum jam. Another blogger can tidy up their blog and give some direction on where to make changes and suddenly I am away on my blog housekeeping again. Firstly the jam. I love comments and often discover wonderful new blogs through comments. Admittedly I sometimes don’t have time to follow up new bloggers but I do so as much as I can. A few weeks ago, I had a lovely comment from Kitchen Butterfly. I visited her blog and found it a joy to explore. 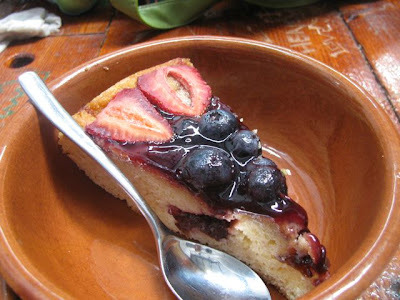 I loved her post on ‘if Rudyard Kipling was a foodie’ and then I found her Plum post. 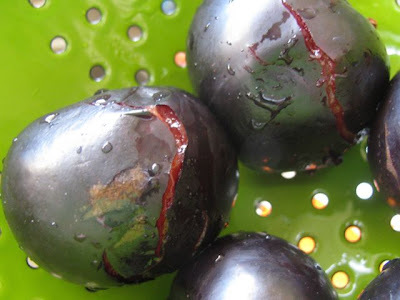 As it happened, I had over ripe plums sitting in my kitchen as I read all her wonderful ideas for what to do with plums. I decided to try her simple plum jam recipe. Last year I tried a peach and pineapple jam. It never set and tasted far too sweet. I don’t eat jam really regularly and decided I should stick to chutneys. In fact, I only finished up the jam in January, a year after I made it. But I do have a great love of the dark depths of a jar of plum jam. 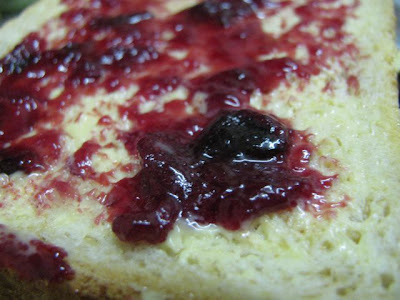 This jam was so quick easy and delicious that it has made me reconsider making jam. Everything went right. There wasn’t too much scum so I didn’t bother scooping it out. The jam wrinkled on the saucer so nicely as soon as I tried it. It even coped when Sylvia kept me from checking it and I had to just tell E to turn off the gas flame until I could look at the consistency. And when I tipped it into the jars, I wished for a funnel that folded up into a drawer. When I searched for one, lo and behold I found one. I reduced the sugar a little and that worked fine too in keeping it from being too sweet. If only every recipe worked so well. And it turned inedible plums into a gorgeous deep purple jam. It is so nice to have home made jam about the house. We are halfway through the second jar already. It was also helpful to be able to read my previous post about jam for tips (mainly on what not to do). When the blogosphere delivers it is a beautiful thing. 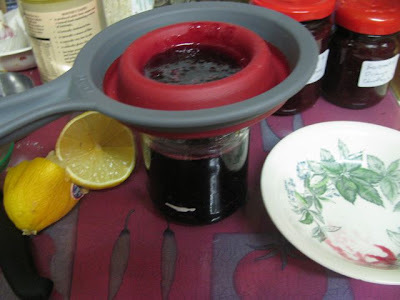 Not only did it help me with my jam but yesterday I saw that Nupur had tidied up her blog. She mentioned that she had been using the new Blogger Edit Pages function. I had seen it but not understood what it meant until I saw Nupur’s great new menu under her header. I am easily distracted with such diversions. Immediately I looked up this function and have started to rearrange my key information pages. This will be an ongoing project, alongside so many others, but I think that already it is quite helpful to have links up there. I am going to move my blogroll there. I don’t update it as much as I should so this is an opportunity to do so. But it makes me sad to see links to bloggers who are no longer updating their blog. I worry they might return and so I don’t want to delete their link but I also worry that the list gets too long. So it will take me a while. I have also started a new page on kudos as a way to acknowledge some of the lovely awards other bloggers have given me. Which reminds me that I still intend to do a post on the Happy 101 Award that Tanna and Katie have given me. Let me know if you have any feedback on the new pages that are going up under my header. I think it is a more prominent place but it means archiving my indexes etc and opening up new pages that do not allow for comments. As I said at the start of this post, I love comments and can get a lot of connections and information from them as well as some warm and fuzzy feelings. So keep them coming and I look forward to more serendipity. Spoon hot jam into hot jars. Seal, cool and label. Enjoy! It’s lovely and quiet in our house right now – husband, baby and cat are all asleep. We are going out for lunch in a couple of hours but I am loathe to wake them yet. 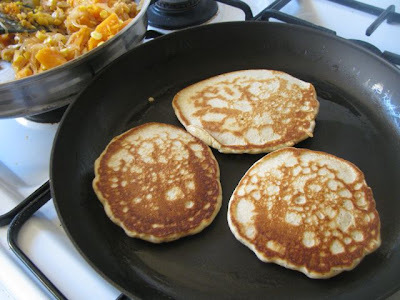 I should do some cleaning but I want some time to tell you about what we have been eating this week, especially the blinis I made on Shrove Tuesday. It seems I have missed my chance to make pancakes for Shrove Tuesday on the last few years. Hence this year I decided that despite my new eating plan, I would make pancakes on Tuesday come hell or high water! (After all the idea of a plan is only to inspire not to restrict!) The main question was what sort of pancakes should I make. So many wonderful recipes. 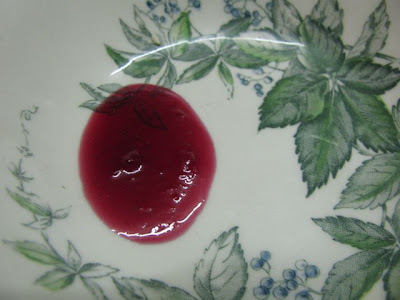 After some searching of the net and my cookbooks and swithering between sweet and savoury, I settled on a recipe I recently found on Ms Marmitelover’s quirky blog The English Can Cook run by the host of an underground restaurant. 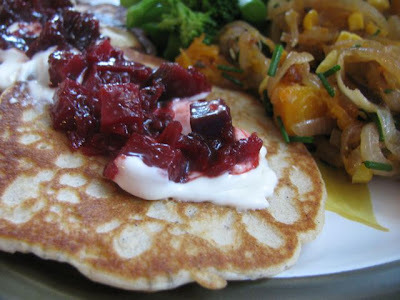 I loved the sound of her blini with buckwheat and crème fraiche (and now I want to make her oven baked cider galettes). It was no surprise to find that the recipe came from Delia. They both served them with salmon, crème fraiche and dill but I decided they would look pretty with crème fraiche and beetroot chutney. 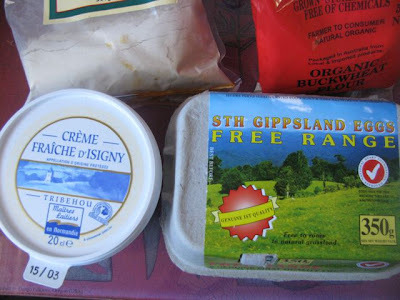 On Tuesday I was at Clifton Hill and while it seems we might have lost Sylvia’s loved clip-on pram toy, Jethro, we did find crème fraiche, which is not so common in these parts of the world. It cost three times as much as sour cream, which I had planned to use, but I couldn’t resist the real thing. I got home in time to let the batter rise for an hour, twice. What an achievement! I haven’t made yeasted pancakes before but I loved the spongy nature of the batter when I stirred it after it had risen. Despite flat egg whites due to my botched job of separating the eggs, the blini were lovely and light. I loved the crème fraiche and chutney on them. I also really enjoyed the side dish I made with onions, corn and pumpkin. I fried sliced onions for quite some time til they were soft and caramelly. I cooked the corn and pumpkin in the microwave and added them, a pinch of salt and some chives a few minutes before serving. Delicious. Sylvia had a taste of the blini and liked it but she preferred the steamed broccolini. It has been another good week for Sylvia with eating. She has tried lots more new things like vegie sausages and eggplant parmagana but I was really pleased to see her enjoying foods she has tasted in the past and not really taken to. When I first gave her steamed broccoli she didn’t like it but it was hard to keep her hands off it on Tuesday. She had a leftover blini for breakfast, vegies in pastry for lunch and falafel for dinner this week. I made more muffins that I will post about soon and she was loving sourdough bread. When I first gave her sourdough she screwed up her face. 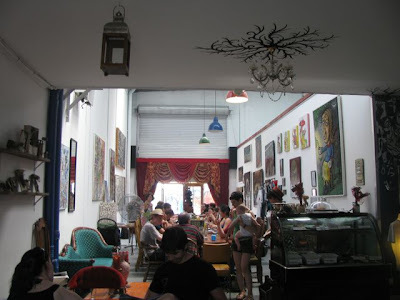 This week I went to CERES café with Yaz and to Animal Orchestra with Jenny. Sylvia is now too active to sit in the pram but will play about at my feet, though I have to watch she doesn’t get underfoot. She sat on Yaz’s knee and had some of my buttered sourdough toast and even enjoyed a taste of the marinated smoked tofu. 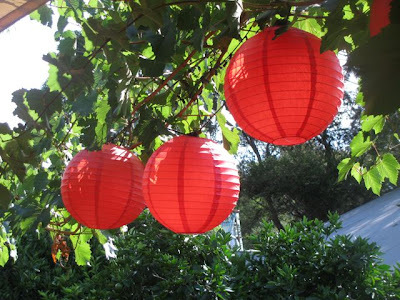 The red lanerns were up for Chinese New Year at CERES. At Animal Orchestra Sylvia had some more sourdough bread that I got with my sweet potato and pear soup. As for E and me, we ate well this week too. I made a lovely tomato and cabbage stew on Sunday with leftover vegetables. Sylvia had a version with less seasoning than us and we all had a few nights meals out of this. I had to find some inspiration to use up my feta. I made scones with it and then last night we had a Spinach, Feta and Fig Salad. It had spinach, yellow capsicum and spring onion with a lemon and honey vinaigrette which I made with too much lemon and not enough honey. 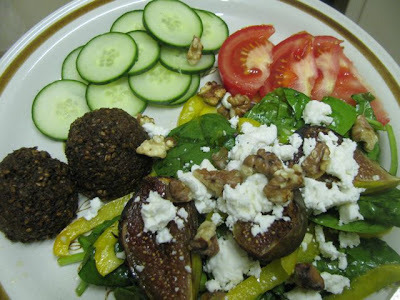 The grilled figs, toasted walnuts and crumbled feta on top really made it quite substantial. If I make it again and get the quantities right for me I might post about it. I loved the blinis (and so did E – well sort of). They didn’t taste as yeasty as I expected but were very good. I would probably just buy sour cream next time and maybe serve them as a stack rather than spreading them over the plate. They can be sweet or savoury. I had some leftover ones with maple syrup and then, for old times sake, sugar and lemon juice. 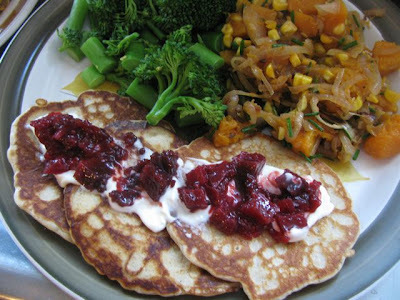 They do need a little time so are not the sort of pancakes to get up and make for a quick breakfast unless you can leave them to rise in the fridge overnight (I think this might be possible). I am sending them to Susan for her weekly Yeast Spotting round up of all things yeasty on food blogs. As for my peace and quiet, of course it couldn’t last. E is up and having his breakfast while reading the morning papers – we have stopped getting the Sunday Age and now are getting the Age and Weekend Australian on Saturday, so there are plenty of newspapers about this morning. Sylvia has had a lovely sleep and is now up and having fun with a cardboard box and some door draft excluders or clutching at my legs. So I will leave you with the recipe and start getting ready to go our for lunch. 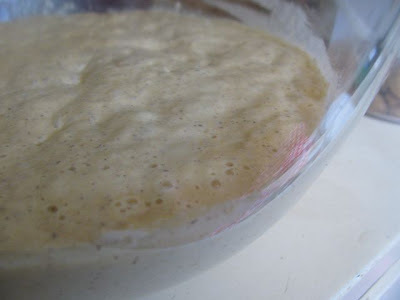 Mix flours, salt and yeast together. Heat crème fraiche and milk until it is lukewarm (if it is too warm it will kill off the yeast). Add the egg yolks and mix. (Actually Ms Marmitelover just seemed to add the eggs together rather than separating them. I think I will do this next time.) Cover with a clean teatowel (mine was dry) and leave to rise in a warm place for an hour. (In Australia in summer any place is a warm place.) Beat egg white till they form stiff peaks (or not) and mix in with mixture. Cover and leave to rise for another hour. I am glad it is the end of the week. I would love to write up all the recipes I have been making but my energy is at low ebb so I will just share with you some simple scones I made on Wednesday. It was one of those pleasant social days where mundane tasks like cleaning and grocery shopping are cast aside for the pleasures of catching up with friends over good food. By evening I was exhausted. While the chores can be cast aside, I still have to get Sylvia fed, bathed and sleeping, which is far more work than a simple sentence suggests. 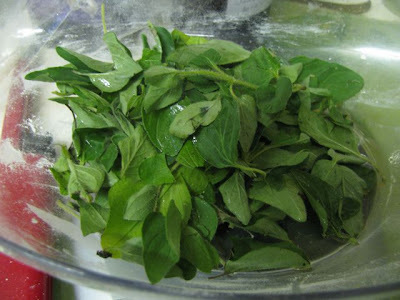 And I had a bunch of oregano I had bought on a whim even though I never cook with fresh oregano. What was I thinking? Fortunately I now have Stephanie Alexander’s Cook’s Companion. One of the reason I wanted it was that it has a section on vegetables, fruit, herbs, spices (and I just skip the meaty bits), each one having a list of foods they go well with. Oregano goes well with tomatoes and soft white cheeses according to this comprehensive book. I had feta and sun-dried tomatoes. So I made feta, sun-dried tomato and oregano scones. 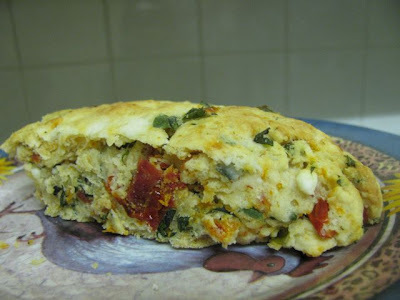 They were adapted from Delia’s Feta, Olive and Sun-Dried Tomato Scones. I was tired, I was rushing and I had had no time to go to the supermarket. 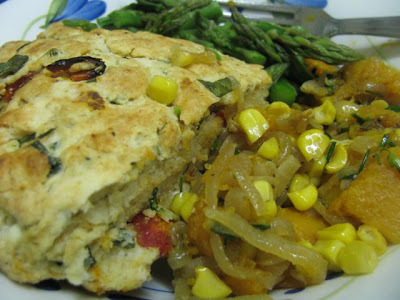 So I simply made the scones, forgot to cut them into wedges and served they with some asparagus from the CERES market and some leftover onion, pumpkin and corn. A quick and easy meal but rather pleasing. The scones were colourful and tasty with a hint of spicy warmth. By the end of the night they were all gone. Place flours, baking powder and spices in large mixing bowl and use a knife to mix in 1 tbsp oil drained from sun-dried tomatoes and 2 tbsp olive oil. 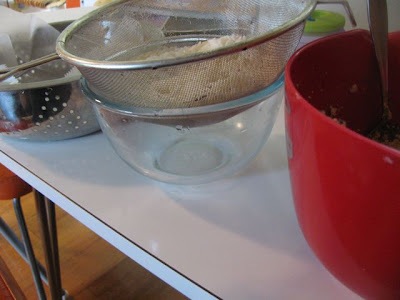 It will result in little blobs of flour and oil – like lumpy breadcrumbs and flour. Don’t worry too much about mixing it all in. Stir in the feta, sun-dried tomatoes and oregano. 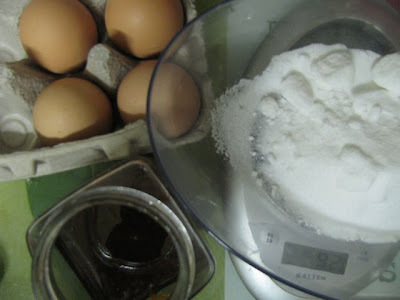 Mix the egg and milk in a small bowl and add to flour mixture (Delia said to add half and then gradually add as much of the other half as needed – I didn’t read the recipe and just added it all – mmm soft dough!) It should come together into lumpy soft ball of dough. Use your hands to briefly knead and then pat into a circle of 2.5cm thickness on a greased baking tray (or cut out round scones like Delia). Brush top with milk and use a sharp floured knife to score into about 8 wedges (or forget to make any marks like I did). Delia also crumbled some feta on top but I didn’t. Bake for about 15 minutes or until a golden brown. Eat warm, with butter if you need it. It started with a picture in a food magazine and ended with a vegan Chinese New Year's potluck. No actually this story goes back even further to my first vegetarian student house where I first encountered Helen Stephen's The Australian Family Vegetarian Cookbook. When we left the house Yarrow offered me the book and I took it, thinking that one day it might come in handy. Helen Stephens cookbook is full of virtuously healthy recipes - they are the sort that give vegetarians the image of being mung bean loving sandal wearing hippies. But it is quite useful, now that I am trying to feed Sylvia virtuously healthy food. 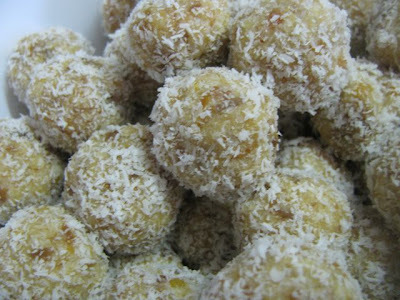 I have had my eye on this recipe which HS calls Apricot Goodness Balls for some time. Loving dried apricots as I do, I feel that a gluten free vegan apricot ball is an important thing to be able to make. I have experimented before but never before been brave enough to try this recipe which contains red lentils. How bizarre! At first they tasted a bit pasty like lentils but I just added lots of coconut, which I am beginning to realise I love in these sort of balls. I used a little apple concentrate rather than honey. Not too sweet, substantial, lots of calcium and iron, lots of dried fruit. They were healthy and quite good. Not scrummy-yummy-must-eat-them-all-right-now good but I-could-eat-one-or-maybe-two-for-a-snack good. I was glad of an excuse to try them. Steph from Vegan about Town had decided to hold a bloggers Chinese New Year vegan pot luck to celebrate CNY despite her family being far away across the continent. I tried to explain to my little niece Grace that it was Chinese New Year and there were Chinese people in Australia who celebrated. But when I told her I was off to a Chinese friend's place for CNY she asked if I was going by car or plane to China! A fellow blogger, Kristy, has recently been diagnosed as celiac so of course we made an effort to make sure there was food she could eat. I knew this was my chance to try some vegan gluten free apricot balls. I also thought the they would be baby friendly for Sylvia. But my main contribution was inspired by a recipe for Pearl Balls that I saw in an advertisement in a magazine. I don't have many Chinese recipes in my repertoire and was a little stumped for ideas till I saw these and thought they looked so gorgeous. 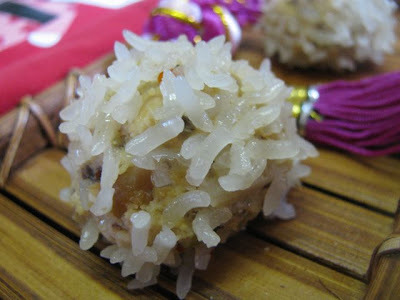 The recipe I saw was for little pork dumplings with soaked rice pressed around the outside and steamed so the rice expands to make them look like little hedgehogs or jewelled balls. It suggested they were traditional for CNY. Slashfood has a list of CNY food traditions and symbolism that lists dumplings as symbolising good luck, fortune and family togetherness. I searched the net for a vegan version without success. I found one site that called them Zhēnzhū Qiú or jun jiu kao (in Cantonese). The recipes I found had some recurring ingredients - sticky rice, water chestnuts, spring onion, ginger, soy sauce, shaohsing rice wine or dry sherry, sesame oil. I decided I could make a vegan version. My first attempt was a disaster as you can see from the photo above. I substituted tofu for pork but it didn't stick together well and when I added corn flour it was a gloopy mess. In despair I threw most of the rice in the pan and turned most of the tofu into scramble. I forgot about them for a while until I made the recent walnut ravioli in the parsnip soup. Blending the tofu with nuts in the food processor made it stick together better. I had enough walnut and tofu mixture leftover to experiment with steaming small dumplings. The tofu I used was quite firm and I also used some flax eggs for extra 'glue' to hold them together. Unfortunately I forgot to soak the rice so I used couscous instead. They weren't gluten free but they tasted good. On the morning of the potluck I remembered to soak the rice and set out to the supermarket to buy more firm tofu. I seasoned the tofu and then pottered about and fed Sylvia before getting the dumplings made. The task of rolling up dumplings and rolling them into the rice was not easy. The wet rice stuck ok but not as much as I had hoped. 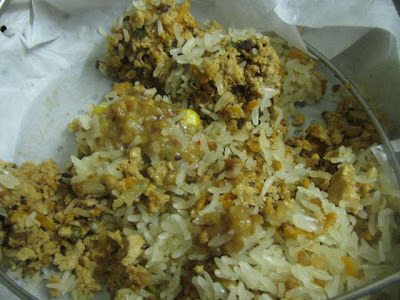 I had soaked more rice than I needed which gave me a good amount to roll them in and then I put the leftover rice with my leftover lentils from the above apricot balls and cooked that up in a stew the next day. When it came to steaming the pearl balls, it would have been useful to have a multilayer bamboo steamer and a wok. I had to work with my stockpot and inserts. I managed to get three layers. The bottom was a glass saucepan lid on an upturned bowl, the second was my steamer insert and the third was a plate balanced on the steamer. A bit complex but it worked so that I only had to steam one lot. As you can see, the ones that I finally took to Steph's weren't too bad. Once cooked the plump grains of rice are sticky enough to stick to the dumplings - and anything else. They were also a bit fragile. The sticky rice made them a little difficult to handle but I put them all on a plate and covered it with foil. I wrapped it in a towel and put it in the bottom of Sylvia's stroller. It was when we had walked the first few blocks to Steph's that I remembered that I had been going to make a dipping sauce. These balls were nice but not too seasoned. I had been wary of too much liquid making them fall apart. A sauce was just what they needed and below the recipe I have copied the sauce that I intended to make. I felt quite disorganised by the time we were leaving. Sylvia and E came along so I wanted to make sure we got there early so we could get back in plenty of time for Sylvia to get a decent sleep. At the last moment I thought about her dinner and threw in some chopped cucumber and grated carrot which is an easy meal for me to prepare. I had forgotten how messy it is and was a bit embarrassed at how much mess it made on Steph's carpet. She was very gracious and explained that it is traditional not to do cleaning on Chinese New Year so she would be cleaning up later in the evening. 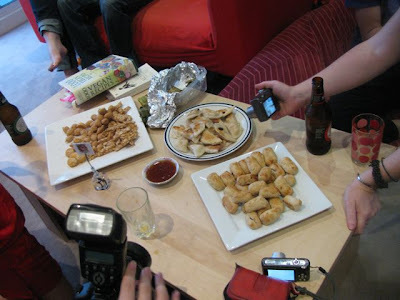 There was heaps of interesting food. I am not great at making sure I know all the names of dishes and who made them but I will try to list what I can remember. When we arrived the appetisers were on the coffee table. Steph had made the pineapple kuih (see her post on kuih for background information on these). Peanuts in batter and spicy mock chicken (gluten free!) wrapped in leaves were also on offer. Cindy and Michael arrived and cooked up some tofu dumplings. I was impressed that they made their own gluten free wonton wrappers. And Toby made some very tasty Chinese Radish Cake. Then the mains came out. 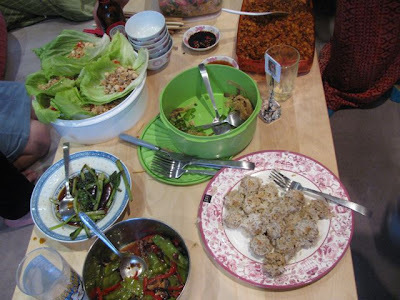 Rachel made the Nasi Goreng just out of the picture (very spicy for me), Tahn made a tempeh, corn and peanut dish - at the top right - that I found very spicy but E loved. Pip made the snake eyes (dried tofu skins and mushroom scrolls) in the green container. Vicki made the san choy bau in lettuce leaves. My pearl balls are bottom right, which no one had heard of so maybe it is not as traditional as the recipes I found suggested. Sylvia enjoyed one but there was too much seasoning for me to give her too many. 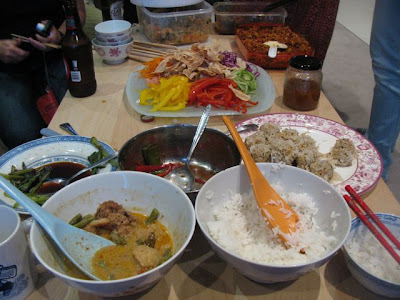 I was glad of Tahn's snow pea and capsicum dish and Steph's choy sum because there weren't lots of vegies. There were also some curries that didn't make it into the photo and some rice. It was quite a job keeping Sylvia away from all the food as she was very keen, particularly on the rice. 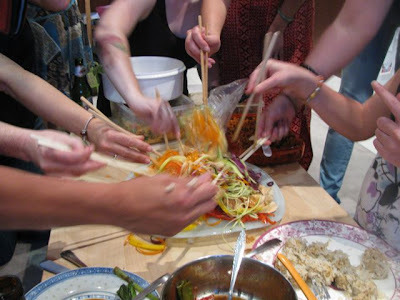 The showpiece was the yee sang that Jo and Emily brought along. Steph wrote about this traditional dish. 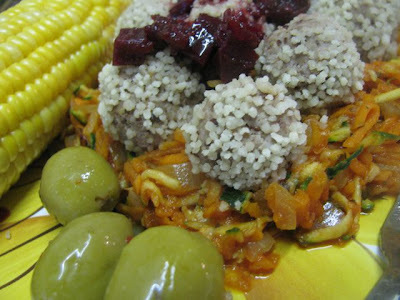 It was a dish of colourful chopped vegetables (see above) with dried stuff (pappadams) and sauce. 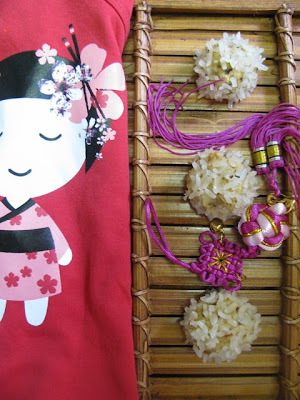 Part of the tradition is using chop sticks to toss it all together - the higher the toss, the greater your abundance. It was lots of fun as you can see below by the movement of the chop sticks. Then came the desserts. By now Sylvia was tired and we had to get her home to bed. I told Steph I was going and she cut me a chunk of Vicki's delicious gluten free sponge to take home. I left a bowl of the apricot balls. But as we were preparing to leave E spied the ice cream and had to taste it. I had a quick taste of his. It was intense but good. 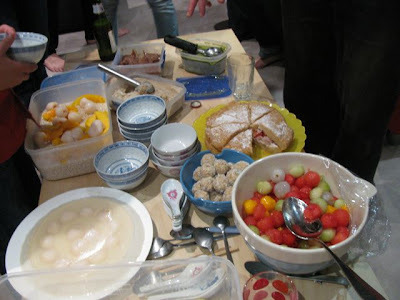 Cindy had made an Orange Szechuan Pepper Ice Cream, and Kristy had made green tea ice cream and red bean ice cream. I was glad I tried these while I had the opportunity. I am sorry to say that I can't tell you much about the rest but I am sure it was interesting and delicious. We walked home along Sydney Road. It is a rare Saturday night that sees us out on our local strip and we were amazed at how noisy and lively it was. I made sure we detoured past the house with all the dolls in the front garden because they were specially dressed up in red for Chinese New Year. It seemed a fitting end to the night. 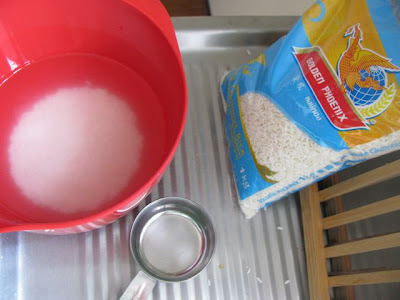 Soak rice in water for at least 2 hours and as much as overnight. I did it for 5 hours which was the amount of time I saw in most recipes. Once the rice has soaked long enough, prepared the dumplings. Mix flax and water in a small bowl and set aside until it becomes gloopy. Blend tofu, cashews, sherry, soy sauce, sugar, sesame oil, chilli, spring onion, garlic and ginger in the food processor until it becomes a thick coherent mixture. Transfer to a mixing bowl and add flax mixture, water chestnuts and mushrooms. At this stage you can let this mixture rest a while so the tofu can absorb the flavours. Line a steamer insert with baking paper. 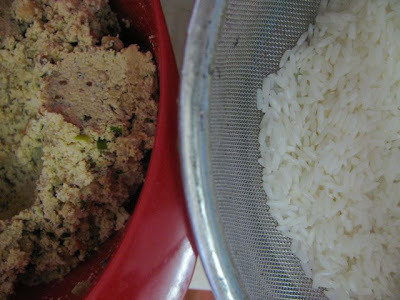 Press into balls about the size of walnuts and toss in drained rice. 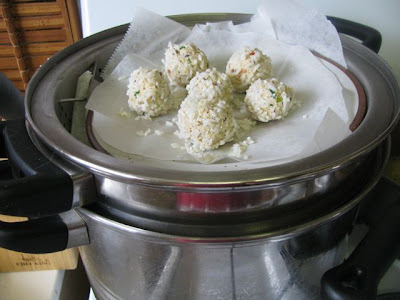 Press the rice into the balls as you toss them. Place balls on baking paper as you prepare them so they are not touching. I needed three layers so you may need a few layers or to steam them in a few lots. Steam balls for 30 minutes. Serve with dipping sauce. Mix all ingredients. The recipe says to do this in the food processor but I didn't want to wake Sylvia who was asleep in the pram so I just finely chopped the dried fruit and mixed everything by hand. Roll into balls the size of walnuts and toss in extra coconut.